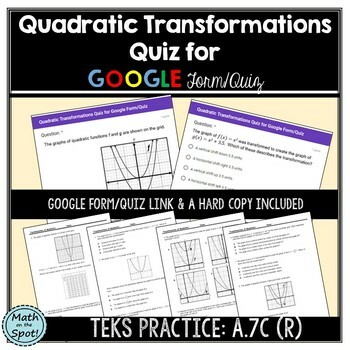 This product includes a 10-question self grading assignment with practice over transformations of quadratics, specifically from the parent function. 3 Vertical Translations, 2 Horizontal Translations, 1 Vertical Shrink/Compression, 1 Vertical Stretch, 1 Horizontal Shrink/Compression, 1 Horizontal Stretch, and 1 Reflection over the x-axis and Horizontal Stretch. both directions and a link to access a copy of the google form/quiz. The google activity may be edited if needed (add/delete questions, change answer type, etc.) The uploaded images may not be edited. a hard copy of the questions (worksheet) that may be printed off. a "work" page for students to use if using the google form/quiz. and as a review for state testing. A.7C (Readiness) determine the effects on the graph of the parent function f(x) = x^2 when f(x) is replaced by af(x), f(x) + d, f(x − c), f(bx) for specific values of a, b, c, and d.